Learning the alphabet and phonetic first letter sounds can never be easier with this soft ABC book that can be taken everywhere. Easy to carry with handles, this book is the perfect additon to car journeys or for quiet moments at home. Each letter is accompanied by a corresponding velcro-backed animal which can be removed and played with seperately or used to match the correct letters to their sounds and hence animals. 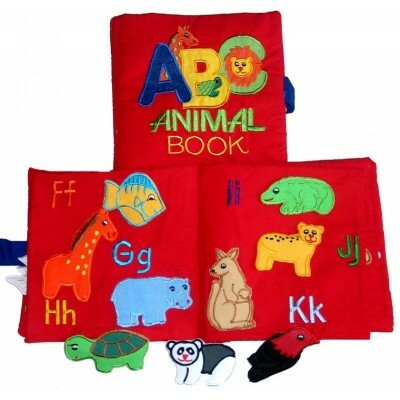 A fun, bright and beautifully embroidered learning tool that any child would love to own.